The Ritual is the fifth album by the American thrash metal band Testament. It was released in 1992 on Atlantic/Megaforce Records. On September 29, 2017, Metal Blade Records released the album on vinyl for the first time in the US along with its follow-up album Low, limited to 1500 copies. The Ritual was the last studio album to include drummer Louie Clemente, and also guitarist Alex Skolnick's last album until he rejoined the band in 2005. 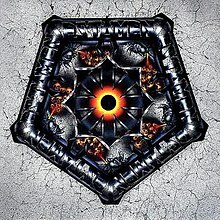 On the record, Testament began exploring a slower and more melodic approach while still maintaining their thrash roots. The album was a minor success, making it to #55 on the Billboard 200. This would be Testament's highest position in their career, until 2012's Dark Roots of Earth, which reached number twelve on the same chart. The record also spawned the band's only charting single "Return to Serenity", which reached number 22 on Mainstream Rock Tracks. By June 2007, The Ritual had sold 485,000 copies in the U.S., although the album has never been certified at least gold by the RIAA. "Signs of Chaos", "Electric Crown" and "Deadline" published by COTLOD Music/Zomba Enterprises, Inc. All other songs published by COTLOD Music/Zomba Enterprises, Inc./Mamatoneck Music/Virgin Songs, Inc.
^ "TESTAMENT's 'Low' And 'The Ritual' To Be Released On Vinyl In U.S. For First Time". Blabbermouth.net. Retrieved August 24, 2017. ^ June 27, 2007 (2007-06-27). "Testament Frontman: 'The Timing Is Right For This Band Again'". Blabbermouth.net. Retrieved 2017-01-23. ^ "Testament / Chart History". Billboard. Retrieved 2018-06-19. ^ テスタメントてすためんと. "儀式 | テスタメント | ORICON NEWS". Oricon.co.jp. Retrieved 2017-01-23. ^ "Testament | Artist | Official Charts". UK Albums Chart. Retrieved January 2, 2016. ^ "Testament / Chart Positions / Mainstream Rock Songs". Billboard. Retrieved 2018-06-19. This page was last edited on 30 October 2018, at 05:59 (UTC).